Christie sponsored the James B. Hunt Jr. Library’s Code+Art contest at North Carolina State University. The contest challenged students to develop large-scale, data-driven “generative art” for library’s 20-foot wide Art Wall and curved iPearl Immersion Theater. The results were on display until April 29. Anthony Smith standing below his first place winning Fractal Forest visualization. 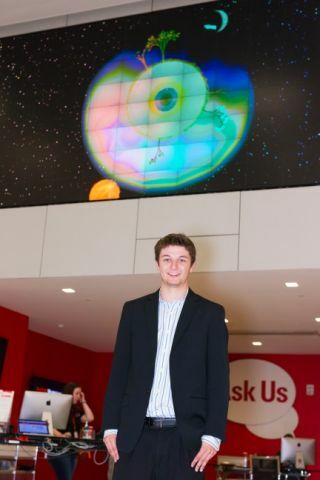 Anthony Smith, a senior in Computer Science with a concentration in Game Development, captured first prize for his Fractal Forest visualization, which shows a planet that grows various types of trees in conjunction with people entering the library. It also features a sun and moon simulation and time and weather data. As people add to and interact with the visualization, it progresses and changes.